A New Jersey Transit bus driver nearly discovered themselves the driving force of the getaway automobile for a sensible joke that seemed to be an ATM theft Tuesday. The video making the rounds on Twitter and Instagram was posted by New Jersey-based “sit-down” comic Darius Kinney. “It is actually only a joke,” Kinney advised Newsweek Tuesday. 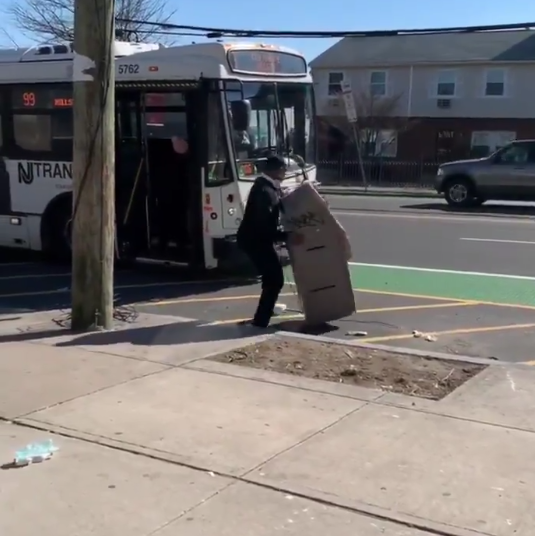 The video filmed by Kinney’s pal exhibits him working with the heavy-looking ATM to maneuver it to the doorways of a stopped New Jersey Transit bus. Kinney asked his friend, who can be heard narrating the video in the background while Kinney struggles with the ATM, to take video of the joke. When Kinney approaches the doors of the bus and says “I’ll split it with you!” to the driver of the bus the reply of “No, no, no, no, no, no, no!” comes out of the doors before the driver closes the doors on Kinney. “We could have made money together!” Kinney says in the video at the closed doors before the bus drives away. “Everybody want to be rich but don’t nobody want to help you get it lol,” Kinney captioned the video before posting it to Twitter and Instagram. “I’m a comedian, I do videos, so I pulled up at the barber shop and I noticed the ATM right next to it,” Kinney told Newsweek, “So I grabbed the ATM and tried to get on the bus with it,” he said. New Jersey Transit must have seen the humor in the video because the official account reposted the video from Kinney Tuesday and asked customers to “Enter a caption here” with the crying laughing emoji. “We asked our customers to caption the already posted video; we did not stage, post or film this video so we have no context around it. We are interacting with and engaging our customers based on something already circulating on social media,” a New Jersey Transit spokesperson told Newsweek. The video Kinney originally posted on Instagram had practically 100,000 views as of Tuesday afternoon with hundreds of feedback as nicely. READ What's Open and Closed? DMV, Costco, Colleges, IRS, Courts, Is There Trash Pickup?